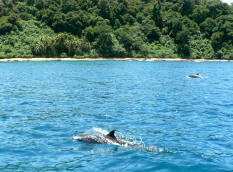 Cahuita National Park dolphin watching and snorkeling is one of our most sought after tours. Please note: a minimum of 2 passengers are required to operate this tour. If you’re flying solo, please contact us and we will try to book you with other passengers. Take a beautiful ride along the coast of the Cahuita National Park to spot Atlantic and Bottlenose dolphins! 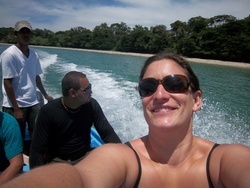 After seeing the dolphins, we cruise back to the reefs of the Cahuita National Park for snorkeling. Then, we’ll head back to the park where we will stop to enjoy fresh fruit and a drink. From the trail you can either walk back through the National. Let us know if you’d like to combine this tour with a guided hike through the National Park or add a fishing tour! We’ll provide you with a quote for the additional adventures. Disclaimer: There is an 80% chance of seeing the dolphins. 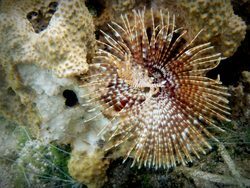 Please remember that these living animals are free – and we like it that way! The beauty of the boat trip is incredible, even without the dolphins. 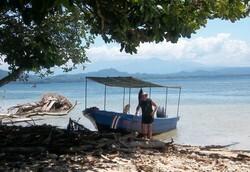 Includes: Transportation if selected, boat ride, snorkel gear, guide, cool drinks and snacks.